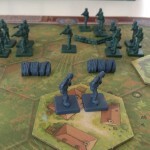 Memoir ’44 – Bring up the guns! Over the past half year I’ve played all scenarios of the base Memoir ’44 game. Last Sunday saw the final confrontation: Saverne Gap. The scenario has several special rules: The hills are impassable and the artillery can’t shoot over it. If two town hexes of Saverne are captured by the allies, it’s an instant win.